In this ebook John Quinn takes you through a groundbreaking, step by step blueprint to build a world beating business. Right now, this is the definitive guide to moving your business on to success you previously only dreamed of. John Quinn’s remarkable 10 Minute MBA formula or how to build a strategic model that works for your business. An amazingly simple but powerful formula that will ensure your business stands head and shoulders above all of your competition. In a revolutionary take on Marketing, the 10 minuteMBA turns the commonly accepted view and perceived “wisdom” about Marketing firmly on its head! In this remarkable section you’ll get “paint by numbers” instructions for achieving all of the business you want with a vastly reduced Marketing budget. Learn the 3 key supporting strategies that will turn your business into a smooth, efficient and profitable enterprise. Finally, learn how to deal with the biggest headache in business…people! Feel confident that you are in full command of your business and that nothing has been overlooked. Above all, simplify the business of being in business and start to experience the enjoyment you got into business for in the first place! So as you can see, ‘the 10minuteMBA, is set to be a very important resource for businesses everywhere, but what we’ve told you so far really is just scratching the surface. The book is also packed with actual tools you can use to achieve the remarkable changes previously outlined. 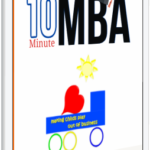 The 10 Minute MBA aims to be the single biggest influence in your business success. Written by John Quinn, the founder of the 10minute MBA this eBook reveals a simple formula that will burn an image in your brain allowing you to deal with any business situation regardless of the scale of the challenge you face.